Creepy crawlers. I'd say I'm not an extremely girly-girl. But (much to my embarrassment) bugs still have the capacity to make me shriek. Solution? A new study suggests that augmented reality could be used to cure cockroach phobia. "...You sit at a desk, wear a virtual reality headset, and then see the desk that you're sitting at covered in cockroaches. Six female participants with cockroach phobia reported extremely high anxiety levels when presented with the simulated cockroaches. 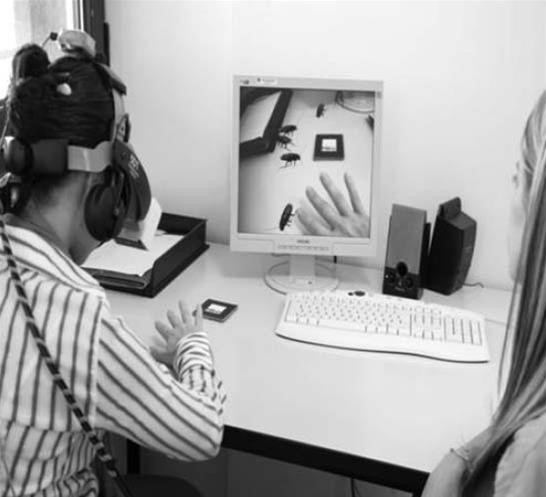 Thus by using the AR system, participants experienced symptoms similar to what they would experience with real cockroaches. That's important, because if people with cockroach phobia don't really think cockroaches are near them, there's no way for them to face their fear..." (Read more). Previously, Virtual Reality Contact Lenses With Terminator Vision.